In early 2016, representatives from the Federation of American Women's Clubs Overseas (FAWCO) reached out to the Connect To Learn team about establishing a School-To-School Connections program with a school they worked with in Cologne, Germany and one of our CTL schools. We identified our partner school in Mwandama, Malawi, the St. Anthony Community Day School, who was ready and eager to help coordinate the exchange, called the Bridging Cultures Workshop. The teachers and FAWCO mentors in Germany designed a unit to span several months beginning in September 2016. In the unit, students learned about the Sustainable Development Goals and brainstormed the challenges faced in our world today. Students also learned about the plight of young people to earn education by reading I am Malala. Equipped with this expanded awareness of the challenges faced by young people in parts of the world to completing their education, students prepared questions for their first Skype exchange with the students in Mwandama. The St. Anthony Community Day School that partnered with the school in Germany currently has 5 Connect To Learn scholarship students enrolled. 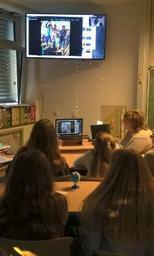 During the first Skype exchange, students asked each other questions about their daily lives both at home and in school, as well as their cultures and religion. In the next session, students shared photos exemplifying their daily lives and the environment they live and school in. After the exchanges, students expressed their appreciation for learning how much they had in common with their peers across the globe.When sharing about their experiences at the close of the unit, one student expressed that "this workshop really helped me to be a better global citizen."